Very similar to the European Police car but in orange instead of green and it should have an East African Safari sticker on the bonnet and a rhinoceros in the box. This one lacks the sticker but is none the worse for that. It is almost unmarked and is a close to mint condition as you’re likely to find outside a shop of unopened boxes. I have now added a good rhino that is probably a reproduction. These models had the excellent steering mechanism so you could direct them using the device on the roof which, in this instance, is a spare wheel. 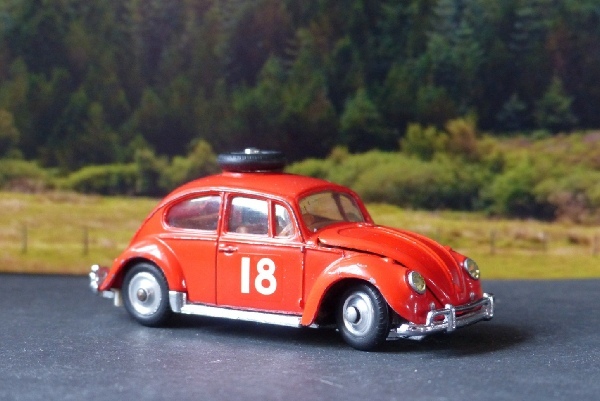 Much easier to grip than the Police lamp and, whilst not really that realistic (I mean have you ever seen a spare wheel on the roof of a Beetle?) It is a huge advance on the silly plastic cylinder on the A60 and I shall not even mention what they did with the Beetle later in its life, thankfully well after my era of stock and interest! Note that there are two variants: this comes in LHD and RHD but with the same model number.